Maybe you and your family have a Christmas tradition similar to mine. On the day after Thanksgiving each year, we turn up the Christmas music and pull out the Christmas decorations. One box is set aside though and saved until the very end. Once the tree is up and decorated, the lights are on the house, and the stockings are hung with care, we gather as a family into the living room to open the last decoration box together. Packed away in the box is our Nativity set. It is a hand carved set from Jerusalem made from olive wood. Carefully we unwrap each piece and place each character in their traditional location. Once it is perfectly set out, our Christmas season is officially underway. The Christmas story has so many unforgettable characters that we immortalize them each year as we set up our nativity scenes along with the rest of our Christmas decorations, but is it possible to see ourselves in any of those characters? Maybe we can even see ourselves as one or two of them? Let’s start with Mary, the chosen mother of the Son of God. The one woman of all of God’s children chosen and selected to nurture, to raise, to teach, to love, the only perfect creation of our Heavenly Father who would one day grow into the man who would perform a perfect and infinite atonement on behalf of all of God’s creations. She would have a responsibility to help him become all that God intended him to become. She no doubt probably felt under qualified to be a mother. She must’ve felt some burden along with her joy in giving birth to the Savior of mankind. Maybe at times she felt the weight of such a responsibility. Perhaps she looked at other mothers and couldn’t help but think that she wasn’t able to “measure up” to her role, or that she just wasn’t cut out for it. However, she had been selected to raise a Child of God, and with Heaven’s help, she would do a marvelous job at it. And then we have Joseph. As the father of five, I can sometimes relate to the feelings that Joseph must have felt prior to the birth of the Savior. Joseph was a soon-to-be young father. He had a young pregnant wife who he must have had the deepest desire to make comfortable, to give all that he had for her, and to see to it that she was taken care of and provided for. I can’t imagine the feelings that Joseph must’ve been feeling that night with his pregnant wife, seeking a little bit of comfort, and him not being able to provide any. He must have been in anguish knowing that she was to give birth to a very special child, while perhaps longing for even the basic necessities and comforts of life. He must’ve worked all through the night doing anything and everything within his meager power to provide a place of comfort and peace for his wife and his new child. This night, would only be the beginning of what would surely become a lifelong pursuit of being a provider and a protector to his sweet little family. And then there’s the angel who commanded them to fear not. He said, “I bring you good tidings of great joy.” Alma’s wish was to proclaim the goodness of the gospel like an angel. We can share the joy of the gospel with those around us in many ways. We can even emulate the angel in our own homes and neighborhoods by living as a powerful witness that real happiness and joy can come by faithfully living the gospel of Jesus Christ and by following Him. Not included in our traditional nativity sets is a very important character of the nativity story. The innkeeper, so the traditional story goes, sent Joseph and Mary out into the night to fend for themselves. But what if the innkeeper had other intentions? What if there truly was no room in the inn and instead of sending them out on their way, he provided the very best that he could have even if it was only a lowly manger? What if the innkeeper guided Mary and Joseph to the stable, cleaned it up, cleared it out, and helped them find a little bit of comfort? Perhaps we might even stretch our imagination a little further and conclude that the innkeeper may have been touched by the Spirit and, sensing the sacredness of what was about happen, thought it best to separate them from the crowd and noise of the inn. Maybe this innkeeper wisely chose a more suitable setting, a place of peace and quiet where this family could spend the very first Christmas together. Can you see yourself at times like the innkeeper, serving those around you and helping to bring comfort and relief to those that lack it? Are those we meet better off for having associated with us? Do we do this by treating others the way we would want to be treated, or as the Savior would treat them? “Verily I say unto you, inasmuch as you have done it unto one of the least of these by brethren, ye have done it unto me”. Finally, the Wise Men would come bringing gifts. 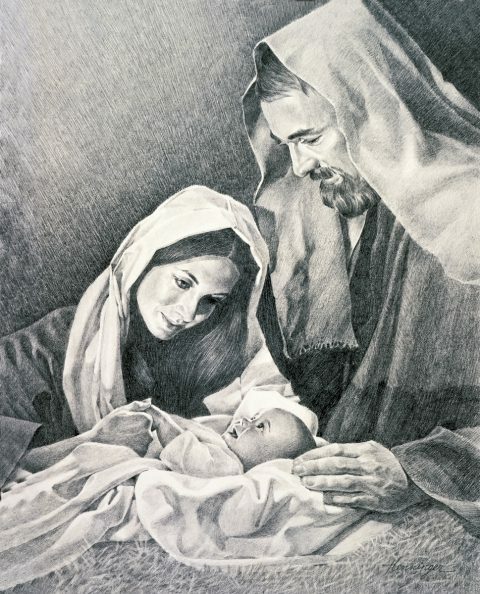 They brought tangible gifts for this young family, but what gifts can we present to the Savior today? President Eyring has suggested that there are two gifts we can give Him. First, we can give him a broken heart and a contrite spirit, repent, and make sacred covenants with Him. Second, we can give Him the gift of doing for others what He would do for them.